5-reels of Fortune awaits you at Jewel Journey Slots. Outrun the tiger, throw knives & match jewels to multiply your riches! Play Jewel Journey Slots and enjoy an epic African slot game adventure! You’ve got the chance to win loads of riches across this 5 reel, 25 payline slot machines. 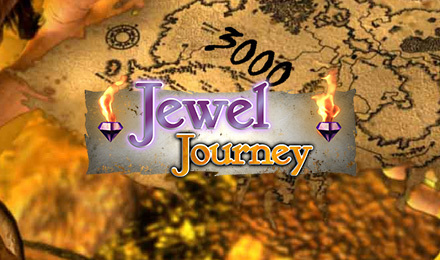 Jewel Journey slots includes free spins, wilds, a gamble feature, scatters and more. Take a trip to the jungle to uncover four exciting bonus rounds. To activate the Great Escape bonus you need to find at least three tigers across your reels. You then get to pick one of three routes and you’ll win up to 100 times your original bet. The Professor symbol activates the free spins feature, with the chance to multiply wins up to 12 times. The next bonus round is the Match and Win and is triggered by three or more Purple Gems. This bonus is a simple pick and match round where you gain more coins if you match up gems on a grid. The final round is activated by three or more Treasure Maps and is the Gem Select feature. You need to choose between five coloured gems and need to match this with the gems in the statues eye. There is up to 60 times your triggering bet on offer. Jewel Journey Slots offers an abundance of exciting bonus features, making it one of the most popular slot machines online.